My picture is missing or has been removed. What can I do? Attend an event and can't find your photo? Let's try to track it down. 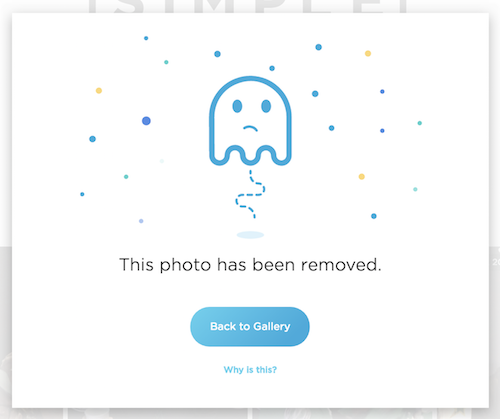 Pictures from Simple Booth are hosted in an online gallery. After you've texted or emailed the picture, you receive a link directly to your own picture that can be shared on social. If your picture is missing, our team would be happy to help you find it but may not be able to, depending on the situation. Simple Booth is not directly involved in most events where our booths are used, because they are usually run by our customers who purchase the HALO® photo booth and apps. Here are some things to try. The most common reason why your link won't take you to your picture is because the picture has been removed. The host of your event may moderate their own gallery and remove inappropriate photos. Simple Booth employees may also on occasion remove photos found to violate our Terms of Service. If the gallery is public, you'll still be able to view the rest of the pictures from the event. There are a few reasons why you may not have received your link! If the venue did not have WiFi or the connection was slow, our app would have queued the uploads, texts, and emails to send out later. If that's the reason, then the host of your event will need to connect their device to the internet before anything will send out to you and may need a couple days to take care of that. We all lose things sometimes. If you think you lost the link, you may still be able to find your pictures if your event has a public gallery. If you are on iPhone we first recommend that you download the Simple Booth app, which can link photos when you verify your phone number or email address, so if you know it went to your email or your friend's phone number you can retrieve it that way. Simple Booth for iPhone also has a great feature for discovering nearby public Galleries, so if you attended an event with a Public Gallery, you should be able to find it there. If you cannot locate your picture via the iPhone app, the Gallery from your event may be private. Our team is not always able to help track down a picture because of the privacy designations set by the event host, but if you'd like to reach out to our team (just use the chat window in the corner!) we will do what we can to help. Want help finding your picture? Our team is happy to help you search for your event if you need, and if the gallery is public we can share a link with you to allow you to look for your picture.